The Best TV blogs from thousands of top TV blogs in our index using search and social metrics. Data will be refreshed once a week. Also check out Top TV Youtube Channels list for Top videos on TV. 2.23 TVWW | TV Worth Watching! 2.38 Streaming-TV | Your news source for everything that streams. TV newsletter is a comprehensive summary of the day's most important blog posts and news articles from the best TV websites on the web, and delivered to your email inbox each morning. To subscribe, simply provide us with your email address. NY, NY About Blog Find local TV listings, watch full episodes of your favorite TV Shows and read the latest breaking news on TV shows, celebrities and movies. Facebook fans 456,084. Twitter followers 1,139,245. Everywhere About Blog TV Fanatic is your source for television news, spoilers, photos, quotes and clips. Facebook fans 844,808. Twitter followers 37,931. New York City / Los Angeles About Blog TV News, Previews, Spoilers, Casting Scoop, Interviews. Facebook fans 216,080. Twitter followers 133,536. San Francisco, CA About Blog News from TV.com. Your reference guide TV Shows, Episode guides, photos, videos, cast and crew information, forums, reviews and more. Facebook fans 102,633. Twitter followers 97,074. Spoiler Land About Blog The Largest Collection of TV spoilers and show information for the most popular shows on TV. Facebook fans 37,913. Twitter followers 82,047. About Blog My sarcastic, slanted, sophomoric, and skewed view on the world of reality television. Reality television featuring commentary from Reality Steve on Bachelor insights and spoilers. Facebook fans 59,666. Twitter followers 174,638. San Francisco, CA About Blog Check out /r/television's favorite shows of all time. A general discussion television community for news, user discussion, reviews, video clips and more. Facebook fans 1,118,611. Twitter followers 488,799. About Blog Everything you wanted to know about TV ratings, renewals and cancellations. Home of the Cancel Bear, as well as insight and analysis about what the numbers mean. Facebook fans 168,454. Twitter followers 65,007. UK About Blog What's on TV is the best guide to UK TV, news, gossip and spoilers about soaps, including EastEnders, Coronation Street, Emmerdale, and top TV. Facebook fans 19,112. Twitter followers 151,359. About Blog Lead source for cancelled and renewed TV show news ratings since 2006. Referenced by NY Times, LA Times, USA Today, ABC, CBS, FOX, NBC, BBC, PBS, TV Guide, EW, and many other respected outlets. Facebook fans 14,475. Twitter followers 5,672. About Blog RealityTea is the hottest blog for your favorite Reality TV Shows. We aim to bring you your daily dose of the hottest reality TV news from your favorite reality shows. Facebook fans 71,012. Twitter followers 45,051. New York, NY About Blog TV Insider is a celebration of the very best in television. We're a guide to what's worth watching — an all-access pass into your favorite shows. Facebook fans 52,701. Twitter followers 14,856. Toronto, ON About Blog TV News, Previews, Spoilers and Reviews. Facebook fans 4,673. Twitter followers 22,966. Los Angeles & NYC About Blog Previously.TV is a site about, guess what, TV. We're talking about last night's shows, vintage programming, and some of the latest TV news, the same way we watch TV: with a mix of appreciation, obsession, grim resolve, and abiding affection. Facebook fans 4,206. Twitter followers 7,806. Mumbai, India About Blog TV News, TV Gossip, Bollywood News, Bollywood Gossip, Celebrity, Celebrity Gossip, Celebs, TV Shows, Movies, Entertainment News. Facebook fans 1,135,773. Twitter followers 177,062. Australia About Blog Australia's leading TV blog is the 'go to' site for industry and public alike, full of news, ratings, reviews & more. Facebook fans n/a. Twitter followers 17,254.
near Orlando, Fla., USA About Blog Reality TV news, behind-the-scenes reporting, reality show reviews, and news analysis about reality shows and unscripted television. Andy Dehnart finds the real in reality television. Facebook fans 7,920. Twitter followers 14,426. About Blog News, information, episode summaries, message boards, chat and games for unscripted television programs. Facebook fans 14,230. Twitter followers 4,665. About Blog News, Spoilers, Recaps, Results for American Idol, The Voice, SYTYCD, DWTS and More. Facebook fans 1,434. Twitter followers 13,169. About Blog TV Shows Ace will give you the best in television news and spoilers. Check us out for soaps, reality TV and more! Facebook fans 341. Twitter followers 15. About Blog The television business is evolving rapidly, and TelevisionWeek is, too. With its coverage of the people, events, programming and new technology trends that affect the industry, TVWeek has always aimed to be the insider's guide to the business behind the screens. United Kingdom About Blog Unreality TV is the UK's biggest reality TV blog, writing about UK and American reality TV shows such as X Factor, American Idol and much, much more. Facebook fans 14,718. Twitter followers 21,529. 23. TVWW | TV Worth Watching! Cherry Hill, NJ About Blog Featuring Bianculli's Best Bets and regular TV columns reviewing and recommending the day's very best television offerings - whether they're weekly series, documentary specials, movies, web series, children's offerings, or bizarre but worthwhile cult items. Facebook fans 3,171. Twitter followers 6,688. Los Angeles, CA USA About Blog Ken Levine's daily column about writing, producing and watching TV sitcoms, TV dramas, film, pop culture and life. Milwaukee, WI About Blog Know what's great on TV with Channel Guide Magazine! Inside our monthly TV magazine you'll find TV listings, celebrity interviews & best TV bets. Facebook fans 8,006. Twitter followers n/a. New Jersey, USA About Blog TVSource Magazine features breaking television news, reviews, inside scoop, celebrity interviews, and more in pop culture, entertainment, music and awards. Facebook fans 2,105. Twitter followers 14,883. Canada About Blog TV, eh? covers news, reviews and interviews about Canadian television shows, with the odd foray into the odd industry that produces them. Facebook fans 1,664. Twitter followers 11,046. Kansas About Blog Bringing you weekly and daily TV schedules, as well as TV news, reviews, contests, and our honest opinions! Facebook fans 273. Twitter followers 627. About Blog Sports, Shows and Movies on Sling TV Tonight. Facebook fans 621,028. Twitter followers 42,225. About Blog On TVSHOWPILOT we bring you the latest in TV world, so you can find it easier and enjoy it better. On here you will find TV show news and reviews, first impressions on new series, fun posts about our favorite television shows and their characters and so much more. Sit back, relax and read up! Facebook fans 337. Twitter followers 180. About Blog The Medium Is Not Enough is a UK media blog with daily news, views, exclusive reviews and good conversation. There's a bit of a bias towards the latest and greatest US TV, but we also cover UK/British TV and look for the best in international TV as well. Add in film, theatre, art, books, comics, events and media journalism and you'v got one of the best places on the web for media lovers. Online About Blog Celebrating defunct pop culture since 1997! Facebook fans 1,930. Twitter followers 5,152. New York, NY About Blog Fastest on the Planet! TV, Music and Pop Culture news. Plus: The Voice, DWTS, American Idol, Survivor, SYTYCD, Big Brother, Reality TV. Dog lovers! Facebook fans 19,993. Twitter followers 16,765. Australia About Blog Latest news about Television in Australia. Find out about New Shows, Casting Announcements, Reviews & Recaps for Seven, Nine, Ten, ABC, SBS and Foxtel. Editors Kevin Perry and Steve Molk. Facebook fans 2,091. Twitter followers 16,812. In your head About Blog TrashTalkTV is a team of comedic writers who relish in ripping apart morons in our reality TV recaps. From Big Brother and Survivor to Real Housewives and Dance Moms, we've got it all. Facebook fans 1,922. Twitter followers 5,365. About Blog A Blog about TV Shows, Film, Travel, Tourism and Books. Everything Entertainment. Facebook fans 2,375. Twitter followers 2,631. About Blog The latest TV news, reviews & interviews. Facebook fans 196. Twitter followers 2,828. 38. Streaming-TV | Your news source for everything that streams. Charleston,SC About Blog News,Videos,Blogs,Posts & DIY from around the web, your news aggregator on Cord-Cutting, Streaming Media, Movies & Filmmaking, and getting everything out of what your watching TV on. Facebook fans 2,346. Twitter followers 104. Seattle, WA About Blog The Web's most reliable source of TV show recaps, episode videos, exclusive spoilers, news, celeb photos, TV personality quizzes, Trivia, and Slideshows. Facebook fans 90,467. Twitter followers 30,995. About Blog The Nice Girls bring you the latest news, spoilers, interviews, and more on their favorite shows. Facebook fans 433. Twitter followers 1,772. About Blog Taking and reporting about all things TV and Media. Facebook fans 110. Twitter followers 885. About Blog The TV Ratings Guide provides TV ratings-related information, predictions on renewal chances and scheduling, reviews of TV shows, and much more. Facebook fans 24. Twitter followers 218. South Africa About Blog News & analysis on South African television. Thinus is an independent TV critic, writer and journalist in South Africa as well as a pop culture and media expert. He writes breaking news about TV for daily and weekly leading publications in the country and authors trend and analysis pieces about the TV business.In addition he writes regular weekly and monthly TV columns. Facebook fans n/a. Twitter followers 5,296. New York City About Blog Reviewing 12 Monkeys, 24, Big Little Lies, Bloodline, Bosch, Colony, Designated Survivor, Fauda, Game of Thrones, Homeland, House of Cards, Humans, Peaky Blinders, Outlander, Ray Donovan, Sense8, Stranger Things, The: Affair, Americans, Girlfriend Experience, Man in the High Castle, Missing, OA, Walking Dead; Timeless, Travelers, Twin Peaks, Vikings, Westworld movies, music, politics. Facebook fans n/a. Twitter followers 18,733. About Blog The latest news on TV product coming to DVD. Facebook fans n/a. Twitter followers 10,228. About Blog Latest Pinoy teleserye and Lambingan Replay daily tv show, pinoy live streaming, pinoy movies. Facebook fans 2,333. Twitter followers n/a. About Blog Every week I randomly pick a British television show from my collection to watch and then write about it. Pretty simple! Facebook fans 1,445. Twitter followers 2,288. Salt Lake City, UT About Blog We watch TV so you don't have to. Facebook fans 384. Twitter followers 404. 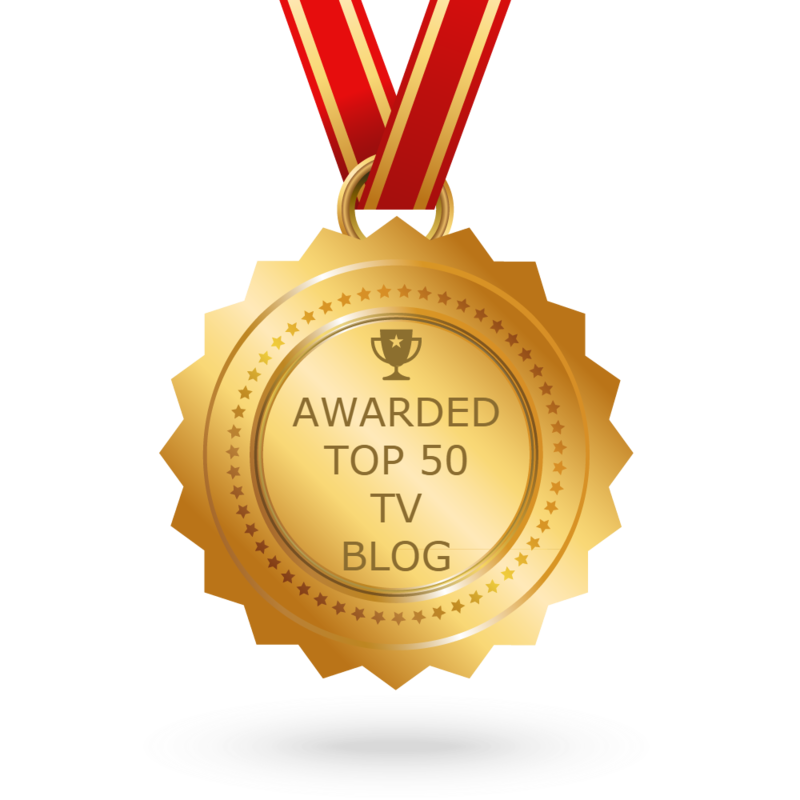 CONGRATULATIONS to every blogger that has made this Top TV Blogs list! This is the most comprehensive list of best TV blogs on the internet and I’m honoured to have you as part of this! I personally give you a high-five and want to thank you for your contribution to this world.